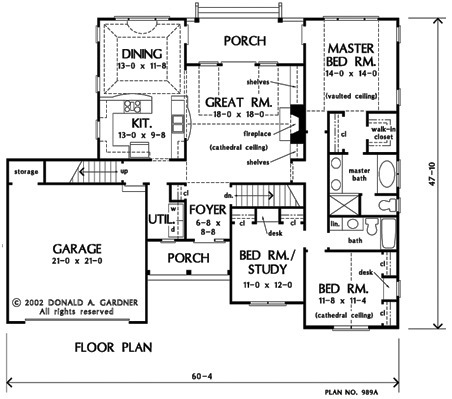 Affordable and easy-to-build, this house plan offers a low maintenance exterior, front-entry garage and family efficient floorplan. Custom-styled features include decorative ceilings and French doors. 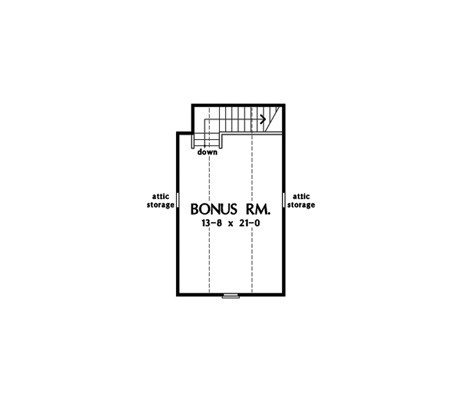 The study could later be used as an additional bedroom, and a secondary bedroom presents a built-in seat between two closets. Note the bonus room. 1st Floor: 1654 Sq. Ft.
House Dimensions: 60' 4" x 47' 10"
Foyer : 6' 8" x 8' 8" x 9' 0"
Dining Room (Tray): 13' 0" x 11' 8" x 11' 1"
Great Room (Cathedral): 18' 0" x 18' 0" x 18' 2"
Kitchen : 13' 0" x 9' 8" x 9' 0"
Master Bedroom (Vaulted): 14' 0" x 14' 0" x 12' 6"
Bedroom #3 (Cathedral): 11' 8" x 11' 4" x 16' 8"
Porch - Front : 12' 8" x 5' 2" x 9' 0"
Porch - Rear : 18' 0" x 7' 0" x 9' 0"